What do you like reading? When you're not at work, it could be all sorts of things. My 9-year-old son has discovered the joy of a good novel. He's just finished all the Harry Potter books and has started on The Hobbit. I like this quote from George R R Martin (in one of the Game of Thrones books): "A reader lives a thousand lives before he dies... The man who never reads lives only one." But when you're reading documents as part of your job, you probably want something a little shorter than one of JK Rowling's enormous novels (the Deathly Hallows is an eye-watering 640 pages). Mark Morris, who used to be the head of clear English at the Department of Health said: "Remember this: those with the highest literacy levels and the greatest expertise tend to have the most to read. They just don’t have the time to wade through reams of dry, complicated prose." It's a great point. We're mostly way too busy to read lots of unnecessary words and pages. So in PHE Screening publications, we like things to be short and to the point. We try to cut out anything that doesn't need to be there so you can get the information you need to do your job as quickly and easily as possible. We also like plain English. This means we won't use a complicated word or phrase when there's a simpler alternative. More and more of our reading is now on digital devices rather than on old fashioned paper. We're adapting how we work to this new way of publishing and consuming information. To make sure that all our documents and leaflets are as good as possible we've just produced a new guide to PHE Screening publications production and review. It's now available on GOV.UK (in HTML format, of course). It covers the whole end-to-end process, particularly around how we involve stakeholders and (for our public information leaflets) members of the public to ensure the information is fit for purpose. The guidance is structured around the following sections. We are seeking accreditation by the NHS Information Standard to ensure we follow best practice in producing new documents. In particular, this section highlights how publications should be based on the best possible evidence - something that the work of the UK National Screening Committee has already taught us well. We also highlight the importance of the Accessible Information Standard in ensuring our information meets the needs of people with a learning disability or sensory loss. 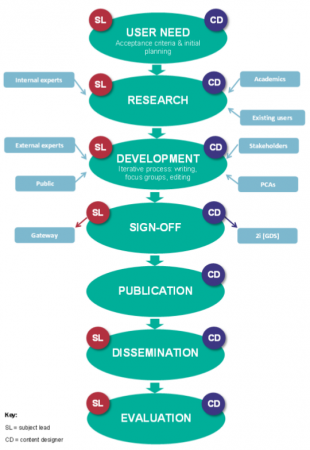 This flowchart, from the new guidance, explains how a new publication goes from initial user need to publication, dissemination and evaluation. This section explains how we ensure that every publication is based on a user need. This ensures we only produce a publication that people will actually want to read. It covers how subject matter leads and content designers work together to produce the best possible publication. This could involve external experts, focus groups, consultations and surveys. In general, we will review publications every 3 years, or earlier if warranted by a change in the evidence base or new policies or guidance. We recognise that people are increasingly reading information online but that there is still a clear need at the moment for printed public information leaflets to support informed choice. All documents require appropriate approval before publication. This ensures both that the content is accurate and that the user needs have been met. We aim to publish documents on GOV.UK where users can find and search for them easily. We don't provide printed copies of documents unless there is a clear business case for them. It's worth pointing out that we also work closely with NHS Choices to ensure that their information is updated at the same time we update our leaflets for the public. In general, we use the blog to highlight new and changed publications. It is always important to evaluate publications to check they meet their objectives and learn what we could do better next time. We are developing a separate evaluation framework for this which we will publish in due course.